The EC is a modular device that can be easily setup in a wide variety of configurations to achieve different process effects. In R&D, control pressure, cavitation, impact, shear, and process duration. Configure the process for your product. With the EC, YOU control the flow, knowing scale up is guaranteed. Entering product is first fed into the system’s Intensifier Pumping System, and is then forced at high pressure through the EC nozzle, producing a high velocity jet stream. Process control starts right at the EC inlet, which can be laminar, for a gentle process, or turbulent for pre-mixing. The product then flows through a nozzle with a small orifice starting at 0.004" (0.1mm). The small orifice induces high shear, and the sudden acceleration together with pressure drop upon exiting the orifice induces cavitation. Product continues flowing into an absorption cell containing various orifices, starting from 0.02" (0.5mm) and larger, where the enormous kinetic energy of the fluid jet is absorbed into the product by manipulating the flow and translating its velocity into forces of shear, cavitation, and/or impact. In Parallel Flow setup, shown below with many alternating orifices, the product flows in one direction and exits from the opposite end of the nozzle. In Reverse Flow setup, shown below with shorter absorption cell, the product is forced to flow back towards the nozzle, creating an annular stream around the incoming jet stream. The relative velocity between the two streams generates high shear. When the product contains solid particles, then particles from each stream impact particles from the opposing stream. Altering the inner diameter may be used to induce additional cavitation. The length and size of the absorption cell determines the process duration. All BEE homogenizers include a means of exerting back-pressure to prevent boiling and affect cavitation. 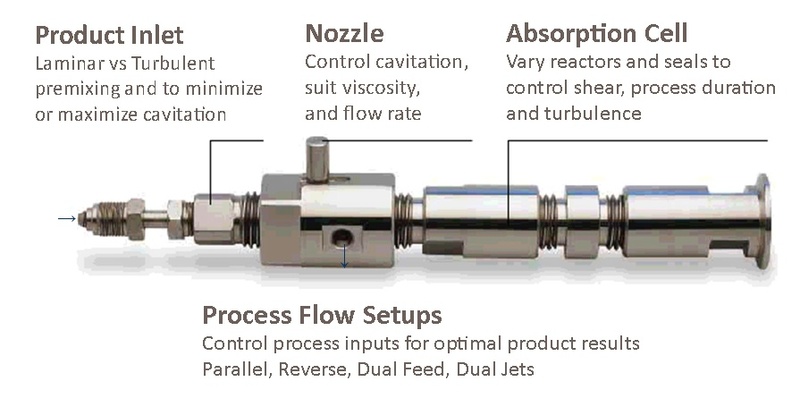 In Dual Jet Flow setup, shown below, two product inlets are used with two nozzles to create two impinging jets of product for the most intense process. Process duration is controlled by the length of the Absorption Cell. When scientists can manage process inputs in order to optimize the output, unprecedented results create new and improved products. Once the ideal product is achieved the process can be optimized to minimize manufacturing time and costs. Scale up is guaranteed.